Labour Housing Spokesman Phil Twyford talking to reporters in Parliament. Photo by Lynn Grieveson for Hive News. Labour's Housing and Auckland Issues spokesman Phil Twyford has called on the Government to use its upcoming National Policy Statement on housing and urban land use to abolish Auckland's Rural Urban Growth Boundary (RUB) and to free up density rules to accelerate Auckland's ability to grow housing supply both out and up. Twyford also called on Councils and the Government to use new methods of funding infrastructure so that Councils don't have to lump costs on all ratepayers and on developers, who are stuck paying high development contributions that they pass on to home buyers in a lump sum. Twyford said Councils and the Government should work together to create special purpose vehicles that can borrow using bonds backed by targeted rates, which would reduce the up-front burdens of infrastructure costs on developers and on ratepayers elsewhere in the city. Instead of paying development contributions, a developer would instead just build the house and a council or Government-controlled special purpose vehicle would issue bonds that were serviced through targeted rates to home-owners in that development. This would allow Councils to avoid asking ratepayers in general to pay for the heavy infrastructure costs of new pipes and roads and lighting and footpaths for new greenfields developments in other areas, and it would allow the Council to avoid further increasing its existing core debt. Using such a vehicle essentially takes advantage of the lower borrowing costs of Governments than of individual home owners, and removes the local political constraint of Councils having to get all ratepayers to agree to take on more debt that is used to fund specific developments that only some ratepayers get the benefit of. Auckland Council borrowed NZ$250 million in late March for 3.04%, while home buyers face interest rates of over 4%. "Over 25 years the urban growth boundary hasn’t prevented sprawl, but it has driven land and housing costs through the roof. It has contributed to a housing crisis that has allowed speculators to feast off the misery of Generation Rent, and forced thousands of families to live in cars, garages and campgrounds," Twyford said. “Labour’s plan will free up the restrictive land use rules that stop the city growing up and out. It will stop land prices skyrocketing, and put the kibosh on land bankers and speculators," he said. “Nick Smith is talking up his soon to be released draft national policy statement under the RMA. But to avoid it becoming yet another of his long list of his ineffective stunts, he needs to stop land bankers by doing away with the urban growth boundary – and make sure it doesn’t re-emerge under a different name. The urban growth boundary creates an artificial scarcity of land, and drives up section costs," he said, pointing to studies showing land inside the boundary is up to ten times more valuable than rural land. Twyford said the Auckland Council was already talking about replacing the existing RUB (which replaced the MUL from pre-Super City days) with zoning rules, but he said such zoning rules still restricted development and enabled land-banking. “It is not enough for the Council to progressively add more land zoned for development here and there. That just feeds the beast of speculation that is an inevitable result of having the boundary." Twyford also called for careful spatial plans for new development corridors that connected new developments with public transport corridors and protected certain areas such as Auckland's Northern beaches and fertile horticultural land near Pukekohe. Twyford said freeing up growth on the fringes needed to go together with allowing more density close to the CBD and around transport corridors, "so people can build flats and apartments in parts of the city where people want to live, particularly around town centres and transport routes." Twyford said Labour was not specifically proposing US-style Municipal Utility Districts, where new privately-controlled urban authorities are created that can issue bonds, pay for infrastructure and charge targeted rates, but saw the central Government and the Council working together to either create special purpose vehicles that issue infrastructure bonds or do it outright from a Government authority. “It is also essential to reform the way infrastructure is financed. The cost of new infrastructure must rest with the property owners of new developments to prevent the ratepayer carrying the can for expensive infrastructure investment in places where it's too expensive to build. Labour proposes using bond financing paid back by targeted rates over the life of the asset. This can range up to 50 years in some of the jurisdictions using this mechanism," he said. Building and Housing Minister Nick Smith said he welcomed Labour's repositioning on the RUB and a broad political consensus was helpful, but he stopped short of endorsing a full abolishment. "The new Unitary Plan is only six weeks away from going to the council, and I'm confident it will provide a far more permissive approach to new housing because of the depth of analysis that has gone into the new plan. It would be counter-productive to ditch this work at this time with a simplistic approach of just abolishing city limits. We still need some rules to ensure new urban areas have appropriate infrastructure and services and that we make separate provision for industry from housing," Smith said. Finance Minister Bill English also welcomed Labour's stance on the RUB at a stand-up news conference called hastily in Parliament. He said the broad political consensus was something the Auckland Council should take into account as it considers the Unitary Plan. Economist and former Reserve Bank Chairman Arthur Grimes, who has researched the effects of the Metropolitan Urban Limit on land prices, said he also supported its removal and a change to infrastructure financing, as well as the relaxation of density limits. Along with other researchers from Motu, Grimes found in 2008 that land prices inside the Auckland boundary were 10 times higher than outside the boundary. See my 2009 article on that here and subsequent Productivity Commission research showing similar results here. "I'm partial to removing whatever they want to call it this week -- the Metropolitan Urban Limit or the Rural Urban Boundary," Grimes told Interest. "There are two urban growth boundaries in Auckland. One is a horizontal one and one is a vertical one, and it's important to get rid of both of them," he said. Grimes said he opposed the recent practice of progressive extensions of the RUB, which simply gave land owners serial monopolies on land that pushed up land values. "The way it's been discussed in the draft Unitary Plan really shows a misunderstanding of basic economic principles and is almost designed to give people their own specialised monopoly for a while that forces up the price of land." Grimes also supported moves to finance the infrastructure needed for development with targeted rates, pointing to other similar tools used overseas such as as (Tax Increment Finance) TIFs. "These sorts of things are quite mainstream internationally and would seem to me to make a lot of sense to investigate. I can't see major fishhooks in them and they're definitely worth looking at," he said. Grimes also said Councils also had low debt ratios in New Zealand and linking rates payments to infrastructure bonds was an accepted and sensible practice. Property Council CEO Connal Townsend said he agreed with Labour's call to abolish the Rural Urban Boundary. “The Rural Urban Boundary is a barrier to entry into Auckland’s land market which will continue to distort market behaviour. An artificial boundary that chokes land supply is counter intuitive," Townsend said. He said he also agreed a rethink of infrastructure financing was needed. “We know that paying development contributions through targeted rates over a number of years is workable. And, we already have the Local Government Funding Agency which more and more councils are starting to make use of," Townsend said. "That is a good start but we need to build onto that and look at alternatives. Central Government assistance is needed in looking at private funding options for infrastructure provision, out of sequence servicing of our future urban areas, as well as in reducing councils’ costs when it comes to hedging risks." Business NZ also welcomed Labour's proposal. CEO Kirk Hope said providing more land for building was needed. “With agreement on this issue between both main political parties, it is to be hoped that local government planning decisions will take heed of the need to focus on land and housing supply," he said. ACT Leader and Epsom MP David Seymour also supported the call to abolish the RUB, which he said was ACT's policy. "Hopefully this is a turning point and all political parties will focus on the real solution - freeing up land and increasing housing supply by removing red tape," Seymour said. "In 2014 ACT was the only party that campaigned on abolishing Auckland's urban limit. Extraordinarily high land prices have locked an entire generation out of home ownership, and as the Productivity Commission found, it's the urban limit that artificially pushes up the price of land, he said. Crikey, I thought Labour had finally woken up from their long sleep. Then I read "Twyford also called for careful spatial plans for new development corridors that connected new developments with public transport corridors and protected certain areas such as Auckland's Northern beaches and fertile horticultural land near Pukekohe." Er, isn't that just a new name for zoning? They just can't help themselves from telling people what to do on the basis that they know best. When will we wake from this nightmare? Perhaps we should learn from the Swiss that representative democracy leads to lots of piglets sucking on the government teat and start having more direct democracy, like in the flag referendum. I think Labour are going for the Making Room concept as promoted by the NYU Stern Urbanization Project. As espoused by Solly Angel -author of "Planet of Cities". 1. The expansion of cities that urban population growth entails cannot be contained. Instead we must make adequate room to accommodate it. 2. City densities must remain within a sustainable range. If density is too low, it must be allowed to increase, and if it is too high, it must be allowed to decline. 3. Strict containment of urban expansion destroys the homes of the poor and puts new housing out of reach for most people. Decent housing for all can be ensured only if urban land is in ample supply. 4. As cities expand, the necessary land for public streets, public infrastructure networks, and public open spaces must be secured in advance of development. Roger the issue you had concerns with is no.4. I don't think we can avoid government involvement in this 'setting aside land for major trunk infrastructure corridors' issue, because private individuals by themselves will not do it. Yes, you're quite right, it is just very frustrating as we fumble our way to a method that works. I should be happy that Labour have seen the light and are givng National some competition at long last. Getting to the point where we are willing to scrap large parts of the present system, if that's what it takes, is a big step forward. I think this shows something is fundamentally broken about how NZ is "administered". I can't but help think about John Raulston Saul's 'Voltaire's Bastards'. If you don't allow for corridors at the start you have to pay billions for tunnels and land purchases later on. Allowing for corridors is pretty sensible stuff. Why you are dismissing it I do not understand. Even higher rates for new "affordable" housing? Have a read of the article. It's about how infrastructure will be paid for by infrastructure bonds serviced through targeted rates on residents in those developments, rather than ratepayers in general. Aren't new residents already targeted through development levies? Will infrastructure bonds add to that? Yes they are. Unless the buyers have suitcases full of cash those charges end up in the buyers mortgage. This proposal is to transfer those targeted charges from the mortgage to a council loan serviced via a targeted rate. Very little difference except that councils can get better rates than homeowners. But after they clip the ticket bugger-all difference to the house buyer. Yeah targeted at those houses. So how affordable will they be if the rates plus targeted rates are taken into account. Affordability is made up of lots of things. Purchase price (mortgage), rates, transport. The list goes on. Targeted rates is the only documented method im aware off that has actually addressed house price affordability in some places around the world, and deterred speculators from making a quick buck over the inefficiency of planning on the part of local councils and government. for the first time im interested to listen to any of those goons in government, maybe there is hope after all.. equality is important for our society and housing is a huge factor if not THEE most important. Better social environment for where we live the better it is for all. What should happen in regards to infrastructure for development of housing sites is do what use to happen.... the developer was responsible for the roading, utilities, paths and local & greenery on house development .... whats happened over the last 30 years is that its become the councils obligation to provide that infrastructure at the rate payers cost. Time to go back to the drawing board and get the fundamentals right. Although I like these ideas, I find them 'interesting' politically. It's a shrewd move from Labour. As it is land 'out there' it doesn't fundamentally create really any impact on most Aucklanders, especially if it is financed in different ways that minimises impact on ratepayers. If only it were that easy, Phil. Let's start with the RUB/MUL/UGB. Every council in the country has a RUB even if they don't call it that. What we are really talking about is the non-statutory zones that councils use to direct where residential development takes place. Councils without lines called RUB's still have edges to their zones - it amounts to the same thing. The RMA was never designed to manage these ever-changing zones so, as we are repeatedly told, the process of adding new zones is cumbersome (councils' fault not the RMA's). Because of that, the district plan is basically a treasure map for speculators/land-bankers. Auckland Council and its predecessors have never managed to be firm on their RUB anyway - it keeps moving. Which has always been a signal to land-owners outside the RUB (10-acre blockies and farmers) not to part with their land except at residential prices. To make a difference in Auckland will require directing the council via legislation to seriously loosen the controls over where development takes place and to be very flexible about how infrastructure is developed and financed. No room for Pollyanna ideologies any more. Development bonds and targeted rates are possible but be very clear that all that that mechanism does is transfer debt householders currently load onto their mortgage over to a council vehicle. They will still be paying it off over time but the council can negotiate a lower rate. After you have factored in the council costs to administer the loan I am not sure you would be any better off in a low interest rate environment. In the current Auckland housing market the chances are that buyers of this class of property will be worse off. If this scheme worked properly developers would automatically price these properties lower than comparable properties nearby that aren't funded this way (yeah right) and subsequent sales would also discount the properties to account for the encumbrance in the form of the targeted rate (yeah right). Note also that although mortgage holders may choose to accelerate payments to clear a mortgage quicker they may or may not be able to do that with the loan from the council (it can be done but the whole scheme would have to be set up carefully). I accept that Twyford is heading in the right direction but the whole system of developing land into residential housing is large and complex. The rules of the game are really stacked against achieving affordable housing through a couple of minor tweaks. God knows, Nick Smith has been trying for a decade during his intermittent turns at being a Cabinet Minister and things have only got much worse in that time. Japan was able to build affordable housing after WWII by sheer effort and sacrifice. WTF is wrong with a relatively small city located in the South Pacific? Actually we didn't do too badly until recentish times. From memory Tokyo-Yokohama is still the worlds largest metropolis and their MM is around 5 (don't quote me) - its about twice as affordable as AKL. OK these are pretty small dwellings but more affordable than the equivalent rabbit hutches being erected in downtown Auckland. The key turns out to be central government intervention. These three words have been anathema in our country for the last 30 years but they have served Japan and Singapore well. In Japan one of the key planks was the government owning the land close to train stations. This prevented stupid extortions in these high amenity areas while the rentals provided financing for further transport development. You could date the beginning of the end to 1988 when Treasury engineered the demise of their great rival in the contestable advice stakes, the MWD. I think one of the defining differences is that Japan wanted to move on from feudalism and to focus on economic development. The only way to do that was ton ensure that housing was affordable to everyone, but particularly at the lower end of the food chain. Great to see you're still common taterating, Donald/Kumbel. Still standing on the shoulders of giants like yourself. And still edging ever closer to the Grand Unified Theory of Local Government. It's a life's work. 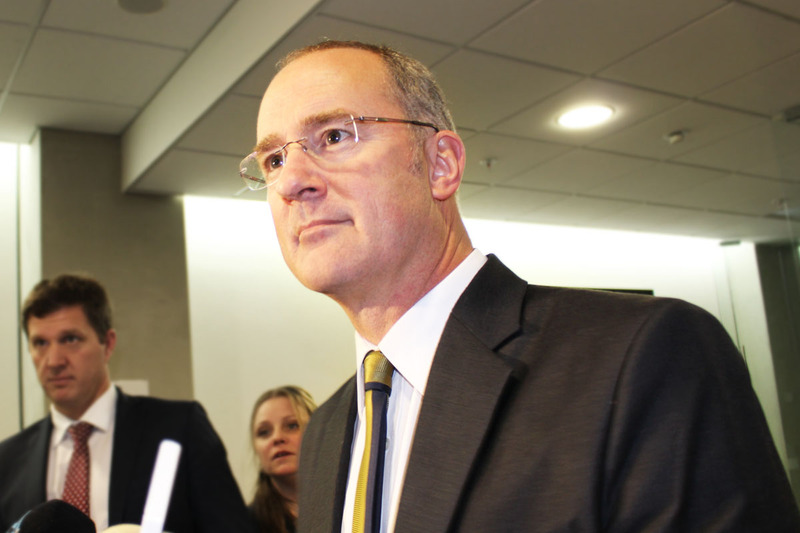 Phil Twyford is at least saying the right thing, BUT then to put it in the hands of council to administer is like giving a toddler a loaded gun. Ideologically, the council won't have changed, all they will do is take this and turn it into a super revenue generating scheme, you will have replaced landbankers super profits for councils super revenue. They will allow section prices to fall a small amount, claiming success, yet the truth will be prices could have been a lot lower. Worse still, with this extra revenue wind fall, they will waste most of it on further bureaucratic largess. Further, council will just manage the infrastructure bond allocation as a defacto restrictive zoning control. They will only give it to developers that develop in the areas they deem suitable and only if it allows council to control the infrastructure. First thought: I wonder whether the increased reports of people living in garages, cars etc is a sign that rents are now well past their limit; ie no more blood to be wrung out of this particular stone. Which begs the question how the newbie "Mum and Dad" property investors are going to fare as even 30-year interest only mortgages need regular repayments. And current rents can't be nearly covering some of the eye-watering Auckland prices. Second Thought: Why don't we just forget about finding any short term solution to the supply problems in Auckland? Even if there are things that can be done now, it's years away before they'll make a blind bit of difference. Wouldn't the Govt (and Govt-in-waiting) be better off with aggressive policies that encourage businesses to move to the regions and employ people there? Tax incentives perhaps? Immigration incentives (eg moratorium on any family reunification visas if sponsor lives in Auckland)? Assistance for those on lower-income to relocate? Why not move office-based council workers to Whangarei?We are in the age of technology after all. No, Whangarei is too nice. I agree Nikki - the rules on the 'demand' side should be changed as no matter how much supply is generated, well its going to the wrong people....It's not going to the people living in garages, tents, cars. It's going to those who already own 1,2,3,4,5...houses. Reduce foreign ownership, reduce influence of speculators/landlords. Why hasn't the RUB prevented urban sprawl? In Christchurch it just encourages a massive leap frog sprawl to neighbouring council areas and ultra low density housing (lifestyle blocks). Is it the same in Auckland or is the effect just to push people to live in garages etc? The thing everyone needs to understand is that planners are stooges for the engineers/accountants. I doubt anyone in a council gives a s--t about what planners think about how to design a city. The main thing is not to let uncontrolled growth cause financial problems. As long as growth is tightly funneled into small areas, infrastructure can be grown more or less incrementally and ratepayers added quickly so that the holding costs of the new infrastructure don't have to be borne by the existing ratepayers. As far as most of a council is concerned that counts as job done. You can spread the RUB further and further as long as you do it in tiny steps. Two key reasons. One leapfrogging as mentioned (have you seen all the new homes in Pokeno which counts as in the Waikato not Auckland?). Two, lifestyle blocks - the statistics on the amount of land they are gobbling up is phenomenal (and most probably don't want 10 acres, just some extra land). Perhaps lifestyle block owners want just what it is? A lifestyle. Aucklanders chose Auckland. Their problem. They should deal with it, instead of invading the provinces. Well they are doing the right thing now aren't they. So let's push for the government to actually implement it. Yes why did National not act earlier? They have had a majority in the house and National has pushed through other controversial policies, like asset sales. Why was affordable housing such a low priority? and because they realise that its not looking good for them to win the next election... they have to get more voters... generation rent is up for grabs. Loony, lefty (in a wishy washy sense), and "lecherous"
All I see is moaning and groaning, why not set up and and idea's conference get some smart ideas from all sorts of people. Why not visit china and see how they house 25 million people in one city. Talk and cheap shots at one another the time is over, it's now time for action. Why does the govt not instigate large quality towers with quality on site facilities like childcare, kindy gartens, schools roof top park and pools 1000 people per tower, the idea would be for the govt to sell these at reasonable prices to people wanting to buy a home no deposit 3% interest P and I over 30 years. Build such tower cities until there is no more shortages. The days are long gone for an affordable home on a 500m2 section certianly not in auckland unless your prepared to pay $1.2/3 million what average kiwi can afford that. Stop the gettos forming by letting people own there own home then they may look after it. Perhaps because China is not all it's made about to be. Factory farming of humans and all that. Sod That. what about some of the most polluted cities in the world, at least some are making money off selling them fresh air. Got a can of that. Hong Kong. Pre Handover. A dime a dozen at the time. Good Times. china is a super power with vast money reserves vs. us, a country that still some people living on this planet havent heard about.. where do you think all this money will come from to fund these? if it was just about planning and building then it would've been easy, funding is central to it all. I suggest unlimited heigh restriction 2km out from queen st then scale it down dramically until you get to cape reinga. Updated with Smith and English welcoming Labour move. This is the most sensible idea to come out of a politician's mouth on housing in a long time. Without a boundary, if a landbanker does not want to sell then you just buy the next block beyond it. He can hold out as long as he wants and there will always be more available land to use somewhere else. This will bring the marginal land cost down to rural values and also enable unrestricted supply. I think it eliminates the monopoly pricing power of up zoned land in the isthmus too. So this move actually released a huge amount of supply. It is classic economics at work. Remove barriers of entry and the massive potential supply keeps prices competitive. Are your sure it will work in the short term? I'd imagine that the first few new areas developed will still command the current prices. There will not be huge numbers developed all at once because of resourcing (builder/ services) shortfalls. It is unknown how long the price signal from the periphery will take to reach the centre. The housing market is not very liquid. In some ways a slow transition would be good and it might be worthwhile investigating how to spread the transition over a reasonable length of time. In the past when protected industries were opened up. Import duties and quotas were gradually eliminated over several years. Maybe a transition to a competitive land supply market needs something like this graduated transition? Only thing is a lot of people still want to live close to the city, so the prices around the city won't come down by freeing up land further out, as most don't want to commute long distances. In particular the current influx of Asian migrants like to live in and around the CBD, so I can't see them wanting to buy a place in Dairy Flat. At last a glimmer of sanity. If you don't like housing spreading past the urban boundary, then do something about the population growth. They have the cart before the horse. It is unconscionable to restrict the urban boundary while pumping more and more people in without any credible and effective way to provide housing. If the high rise housing cannot be delivered in a form that satisfies the public and at a price that is acceptable it is similarly unconscionable to jack up the prices of the alternatives by rigging the land supply market. If they want high rise living the city, they have to offer something desirable and if that is not possible without dishonestly rigging the market then the need to accept the reality that this is not a sensible option. They really have no option but to relent on the boundary because they are headed to a situation where no sane young Kiwi family would want to live there. Carrying on as they are, is only going to make the inevitable crash all the more terrible. It is going to be bad enough as it is. Next they have to deal with monopoly building material suppliers, immigration, foreign investors and the crazy tax system. They may as well do it now because they, or somebody else is going to have to eventually. Auckland City Council, Labour and the Gubmint are having a hissy fit. ACC has overplayed a weak hand in any case.. They are infested with Brit-style Town and Country Planning Act 'planners' (the Brit's motto - we Finish what the Luftwaffe Started), who have not the slightest notion of economics, development cycles, affordability or the other aspects which, on the ground, determine what is built, where, when, and for how much. Planners are expensive in themselves, and they certainly add cost to the development cycle, if only via the injection of Time to all processes. The build-out of the major world cities of yore was, in many cases, following infrastructure provided by private speculators, but with Gubmint incentives. London's tube (John Lanchester 'What we talk about when we talk about the Tube' is a useful primer here, as is Kunstler's 'Geography of Nowhere' for the USA scene. Development followed the lines (tubes in London, horse trams, electric trams, buses in the US). The London tubes were private companies (and at each other's throats) until the early 1930's. - fencing and worksite safety in general - way out of kilter in terms of cost/benefit ratios. Ask an older tradie. The question is, of course - how much benefit is actually derived from this very significant cost (I'd estimate not less than 10% of build, could easily be twice that)? Again, the older tradition of craftsmen builders has little patience with all of this: they operated in a time when one built Up to one's Reputation, not Down to some Code. The Christchurch earthquakes give us an answer. I estimate that 70% of residential builds were done in a time when regulation was absent (pre 1950's), light (to 80's), or at least sensible (to the mid-90's). No-one was killed by bad build structures in residences, once one excludes URM, chimneys and exogenous sources (rockfall etc). Structures twisted, tilted, and cracked. But they did not kill their occupants, in a 2+g vertical acceleration sequence. So the 'old', lightly regulated practices and their built results, have withstood probably the most severe test Gaia could devise. Modern codes add cost but little to no incremental benefit, compared to these. And more cost = less affordability. It's as sad and as simple as that. Prophetic, but many of us, over a decade or more, have been levelling exactly that same general critique. Add in the building materials duopoly, monopoly pricing via local authority connection fees and consenting costs, a complete failure to cut the Gordian knot by successive gubmints and we have the current schemozzle. Local Government 'dithering', while an accurate description as seen from outside the tent, is in fact structural. 1 - Central Gubmint, who can (dimly and fitfully) sense the macro-economic picture which emerges from the 70-odd LG layers whirling away beneath them. CG is purposefully designed to be movable only incrementally, so observing an unwanted, emergent effect (like the AKL hoosing bubble) has no timeline for the fix, even if the causes and cures are clear (which is rare...). 2 - LG pollies, like Len the Bruin, have particular positions to cleave to, and need to not offend enough electors, in order to get elected next time around. Pollies can only set Policy, not Manage, and particularly not micro-manage. So they rely on unelected staff to do the heavy lifting (in every sense, including intellectually) with regard to policy options for proposed changes, day-to-day implementation for existing policy, and reporting to and from on the results of or issues with, existing policy. Most LG pollies are to be frank cowed by the superior horsepower of staff, so tend to occupy an uncertain DMZ between staff and ratepayers. They are essentially cheerleaders for whatever the staff du jour have dreamed up, done, or screwed up. 3.a rigid observance of 'rules'. So staff will unblinkingly decline to use discretion (not in the rules), obfuscate (to divert attention away from their core incompetence), and back each other up regardless of the merits of the event, action, or emergent effect. As they are not elected, they regard Councillors as a passing parade of buffoons, sitting at a distant table, and having only minimal effect on their own closed world. As staff are employed by the CEO, who is in turn the Council's only 'employee', no cultural change will occur without a change of CEO. Dithering, as should be clear, is structural.....the only real handle the Council has is the $ one. Hang about a bit? Are you saying that councils are run primarily for the benefit of those running them? That they are full of very expensive staff administering overly complex processses that achieve nothing of value? Oh dear. Sitting in my car ready to go into the public meeting being held for the housing crisis. Twyford will be here and I will do a full update for my blog tomorrow. I'm curious as to what the atmos in here will be like. Might be irrationally exuberant.....oh no sorry, got myself confused there. Those people are all at the auction rooms. Teary. Lots of swearing. No amount of positive speeches could hide the fact everyone was thinking the same thing. We're screwed. 2. Have some money in the bank, a clear conscience, and be ready to take advantage of the cheap/er house buying most probably coming your way in 4-5 years time. Things will play into your hands if you're patient. The greedy think they're so clever for now - but that will be short lived. Been hearing that since 2004. It was wrong then and it's wrong now. You will get a 10-15% correction at some stage in the next 5 years. But that only takes you back 18 months (maybe). At that point the banks are reluctant to lend so you wont get a mortgage anyway. I hear ya and I'm high fiving! All in all, although it was emotional it was amazing to see so many people in one room who care so deeply about this. I had to hug the girl next to me who sobbed for the first ten minutes. I have to believe there will be some sort of revolution at some point. Humans can only take so much I think. Teary Nimbys or teary people in terms of people who can't get on the housing ladder? When have the nimbys ever been teary? Lots of frustrated people over kids in mouldy houses with permanent lung disease. Lots of passionate speeches about people living in cars and how this will only get worse. Lots of personal stories from the older generation who are embarrassed and ashamed that their kids are locked out. Speeches highlighting the insecurity of renting and the social problems families face when they can be turfed out and shunted around for no good reason (profits...ahem). Lots of inbetween filler jokes about JK and they fact that all we have to do is give up Sky. Highly charge but quite amazing evening, even if the solutions side did fizzle out. "When have the nimbys ever been teary?" I Saw an awful lot of crying over the unitary plan. Hardworker, I like many I am sure, have been captivated by your posts in regard the human element it has added to the pontificating on economic and political theory that most of us do. There are two things that genuinely puzzle me on this issue. Firstly, why oh why can you get yourselves politically organised? Local elections this year and national ones next. It strikes me that in this day and age of social media you don't realise the influence you could have as an organised lobby group. Honestly? The answer to both those questions is, I don't know. For no. 1 and I hate to admit this but I think my generation doesn't care enough. I'm on the higher end of the age scale and we're either mortgaged to the eyeballs and accepting it as the new norm or just plodding along renting and not giving political movement any thought. It's incredibly frustrating. For no. 2 I'd actually love to give somewhere else a try to be honest but quite a lot of it comes down to where your work is. Also there's some resistance to being pushed out of the place you were born and have lived all your life. Ultimately, I just don't think my peers care enough unfortunately. They're starting to open their eyes a bit though. I'd love to see some more social media movement. Hardworker ,thanks for the honest reply. I am certainly not judging merely trying to understand the drivers. This issue is currently front and centre and the wheels appear to be slowly grinding into action after years of seizure. I do hope that some sort of cohesive advocacy group can emerge to represent your interests and continue the pressure as beware the news cycle moving to the next big story. ...even if the solutions side did fizzle out. Solutions are difficult. Basically they opened up the NZ housing market to potentially millions of wealthy people which then naturally pushed the prices up. Effective solutions would require some sort of authoritarian intervention and a certain loss of freedom like Singapore or a relaxing of rules that could see the development of slums. Micro housing or workers accommodation some will see as an affront to human dignity. Increasing wages may offer a solution or just push prices up and make the economy less competitive. It's probably best to just let nature take its course now. All fairly ridiculous to those who have been reading demographia studies since before 2006 where the urban limit has been clearly and specifically blamed for unaffordability in cities around the world. Shame Hugh Pav... doesn't post on here anymore although can't blame people for giving up. Good call. I don't agree with everything he has to say - I think there are some oversimplifications - but there is some basic truth in what he has been rabbiting on about for so long. Bit ironic that the left is turning around to what he has been saying all these years!!!!! Perhaps we will see Hugh knighted one day! From memory Hugh was banned. He is dully repetitive though it doesn't mean he's wrong. There are lots of us who still stay in touch. The only problem with the Demographia reports is that they leap to policy conclusions with a few yawning gaps in the middle. I have no problem with the data. I have no problem with the policy recommendations but, technically, there are still gaps between the two. Where did all those sensible guys go....often with a sense of humour, often with a sense of right and wrong. Hugh was often right, but repetitive, as a means to an end. But nobody listened as they had vested interests in doing the opposite. They were not interested in sensible housing, no money in that...and would have sent them all....into a tail spin. If Govt had ever listened to them, we would not be in the mess, they are trying so hard to dig themselves out of. With your money...of course. Gormless to a man, a woman, or a child, they should be catering for. Their citizens future. Useless tossers, one and all. Now we have to put up with the likes of me. And unfortunately the likes of the rental mob, who do not want the gravy train to come to a shuddering halt. Debt is not the answer for our future. We should be the richest little Nation in the World, not scraping the bottom of the barrel and housing our families and homeless in shanty, shonkey, tat. At prices, even I would wince at. Hugh maintained that immigration didn't matter ("in Houston they accomodated... after Katrina") also that as long as the market is allowed to operate wealth will be generated (whereas each case is different and Houiston has oil services, aero space etc) also he over looks floodplains and towers going up in low rise suburbs etc. Then there are the special financing of development arrangements which as Donald Ellis pointed out are unlikely to make much difference to price long term. He was banned. Shame really. He still posts over on MacroBusiness. Hugh Pav was good. Always stuck to what he believed in. That's all you can ask. Also start by cancelling all of the unstarted SHAs unless they are prepared to lift the affordable housing from 10% to 30%. The whole concept of "affordable housing" as it is defined is flawed from the outset. Some arbitary percentage of the median price does not make something affordable. I believe one of the promises in the election manifesto for the new London mayor was to redefine "affordable" in terms of median incomes rather than median house prices. I challenge Tyford to sit in that traffic for a week and tell me opening up more greenbelt is a good idea. Infrastructure first, then infill housing, then new greenbelt in 40 years time. When will we see a second harbour crossing? Thats 20 years overdue. totally agree on the points! The only thing that frees up infill is the unitary plan so lets see how that plays out. I really hope the council sees sense here. I'm all for it! I think there should be some guidelines like - "Greenfield sites require a railway station". More cars on the motorway is not an option. It was a joke in 1998 let alone 2016. I don't understand what is so hard to figure out. Stop raising NZ's population and stop selling to offshore foreigners. Remove the demand and the market will reset to a true value. 67,000 immigrants in just one year is a city the size of Whangarei. Did 67,000 immigrants bring a hospital, 20 schools, a sewerage system a power supply etc etc?? no of coarse not, the NZ tax payer fronts that at the cost of lower wages, inflated house prices increased rates and talk of more taxes. Why are NZers tolerating the loss of our lifestyle and the theft of our childrens future. Our young people need the jobs, the employers will always take the easy option and import trained labour if there allowed to. We are robbing third world countries of their few educated people, we can drive our own taxis, run our own unions, sell our own real estate and manage a corner dairy. Most of the immigrants (although all very lovely people) compete for work with your average Kiwi. Its taken 100yrs to build this countries infrastructure and we give it away and then scratch our heads wondering why we have to build more infrastructure again. Population growth isn't just a matter of building some houses, its the billions of dollars of infrastructure that the councils and government have to provide that causes the hold up. Who wants to pay for it?? The farmers, fisherman and foresters aren't volunteering, they are struggling to cover their own costs. and us Hippies, well where just totally bemused watching the chaos. A child born in New Zealand inherits quite an extensive infrastructure built up over 150 years. That child is then trained from day one to be a Kiwi. If you were to put a monetary value on this it would be rather high, around about a million or more per individual I'd say. unfortunately a lot of those born kiwis are giving up on NZ and heading off overseas to try there luck as they see no future in their country of birth. More overseas-born people live in Auckland than in any other region in New Zealand, Statistics NZ said today. Results from the 2013 Census show that 39.1 percent of Auckland residents were born overseas, compared with just 18.2 percent of people living outside the region. Bang on Zachary, NZers take our infrastructure for granted. The roads and public buildings and Hydro dams were here when we were born so we think its the natural landscape. Most of that Infrastructure was built and paid for by the WW2 generation and the baby boomers. If our population was stable we wouldn't need to build much, just maintain what we have. But now we are faced with having to upgrade Auckland. Imagine if we build a new harbor bridge. The cost would cripple our economy. The Ministry of Works built this country and was dissolved back in the 1980's. We have built almost nothing since. The road and tunnels bypassing Orewa are privately owned and will have a toll on them forever. People are advocating that that is the future we have to look forward to. Paying to drive on an Auckland motorway? we already own the motorways, why should we pay again because we have high immigration? The rot started in NZ when we started selling the nations assets, Telecom, Railways the hydro dams etc etc. now we are selling our last asset which is our low population. Zachery nailed it, being born here is worth a million dollars because of the infrastructure you inherit as a birthright. We aren't selling that birthright, we are giving it away to each plane load of immigrants. Even worse we are letting anyone, anywhere in the world buy NZ land and homes so that we can then pay them rent. Many will agree with your well expressed thoughts. One of the principal causes of the Auckland crisis is the National Government's immigration policy. Yet there is no organized mob directed at the government to stop this idiocy. There needs to be some sort of 21st Century John Minto organizing public opinion to force the Government's hand. The world has far too many people that see Auckland as a desirable place to live than can ever be accommodated along with reasonable property values that allow our upcoming generations to own their own property. I would have thought that reducing demand was equally as important as boosting supply? So far, investors have been hit upon, now it is time for immigrants to be throttled. Is this Labour Right and National Left? Perhaps reducing the ethnic chefs allowed in will help reduce unbridled immigration. Both Labour and National are blinded to demand side of the equation. Maybe time to remember Winston but if in any coalition will probably have selective memory on the immigration issue and use it just to get in and enjoy the baubles of office. support for WP is growing month on month because his party is the only one that would slow immigration. Open up Auckland limits, increase housing devt, then NZ can increase the flow of migrants and investors and students coming in. Whatever party will stop selling our low population will have my vote nigelh. As you say the two main parties can't see the wood for the trees. Winston has been fighting immigration for 30 years and gets labeled as racist. I don't care where they come from I agree with Winston, we don't need them. Cherry pick essential knowledge for sure but kiwis are quite capable of driving taxis, cooking fast food, selling real estate, running unions and managing corner dairies. Will you pay for the infrastructure needed for these migrants Mortgage Belt? because they don't bring any infrastructure with them. The NZ taxpayer has no reason to want to pay for it. All your migrants do is push up the price of housing and put pressure on the infrastructure. A double wammy for the locals. A lot of jobs that students could do go to migrants as well. Shelf stacking, fast food, even newspaper deliveries. If a lot more part time work was available for students it would negate the need for student loans and avoid the situation where they start working life with negative equity. Even with full time work students would still end up with debt due to the large course costs these days. Too bad students need to work, or they struggle when they need to be focused on learning. The Government wants New Zealanders to be homeless. Then once they are homeless they can follow the PM's advice to talk to WINZ where the staff there can belittle them and provide no help at all. You can't bring back feudalism without having peasants. WINZ will most likely be staffed with recent immigrants as well just to make the experience that little bit more exquisite. PM. see... is what is wrong, period. A banker with delusions of adequacy. Never done a days work in his life, but wants to build a Feudal Empire in the Southern Ocean out of Swiss Cheese and Asian breadcrumbs and Sky Tower priced houses, with Casino largess. The Panama lifestyles of the rich and infamous. There's no such thing as a free lunch? We didn't get a new flag, but maybe a new anthem. Great idea jh. But much easier to stop enlarging the population and stop selling land assets to offshore buyers. Within a year or two the housing and infrastructure will catch up and property values will reset at fair value. Everyones a winner including the migrants already here. Just shut the door. We all have to live off our primary producers. If they export 20 billion of produce, then thats our budget for new cars, computers etc. The bigger the population the more people sharing the wealth = less imports for everyone. A country is a business and needs to be run like a business. 1.) More land available immediately for more housing. Housing needs to be affordable so need 1 bedroom and 2 bedroom houses, units or apartments. Prices need to be in the $300 - $400k to be affordable. No point building more house and asking for $600K. (Need to target lower and first time buyer market) None of the properties can be sold to investors. 2.) Sort our Auckland Traffic Crisis. Costing billions per year on getting anywhere on time. Lost work hours. 4.) Fix NZ cat problem. cats control programme to reduce death of NZ bird life. Training owners to keep cat inside a night and early morning. 5.) Use roads to put tram links in or bus and remove the car. Increase ferry links between places. Share cars (most cars have 1 person). Ban diesel vehicles in cities like overseas accept for delivery vehicles. make the air cleaner so we breathe and don't die of premature death due to pollution. 6.) Get McDonalds, Burger King, Carls Junior, KFC, Wendy's etc to only do only healthy options in their store or tax them heavily for sell this unhealthy stuff or complete ban from NZ. Save out Pacific Islanders, Maori from Obesity, health problems by removing these from sale. Also get these large Junk Food Companies to pay for the Health costs. Ie for every burger sold 50 cents goes into the Health Fund at the hospitals for treatment caused by eating and drinking badly. 7.) Encourage schools to put exercise high on the agenda. Daily walk, run etc.